By Geo Paul in Coding. Updated on August 3, 2018 . By working out the sample codes from the previous post, you might got the feeling of what is the actual benefit of using Node.js. In today’s post, we throw in a practical script that clearly demonstrates the use of Node.js in event-based programming. We’ll be creating a simple script that outputs the number of "Facebook likes" of a particular Facebook page. And on top of that, we’ll throw in an additional feature that will update the number of "Facebook likes" every 2 seconds. The output will be simple and plain, probably looks something like this: "Number of Likes: 2630405" and it is up to you to style it using the CSS, let’s get started then! Before we dive into using Node.js, let’s take a moment to think what we’d normally do it with common server-side programming languages (like PHP). If you are thinking to make an AJAX call to find the number of likes in every 2 seconds – you are correct – but this may potentially increase the server overhead. We can consider accessing graph.facebook.com which would be a time-consuming I/O operation. Consider 5 users accessing the same page (which outputs the number of likes). The number of access to graph.facebook.com in 2 seconds will become 10, because everyone will update his/her number of likes once in 2 seconds and it will be executed as a separate thread. That’s not necessary with a Node.js server implementation. Only one access to the Facebook server is required and the time to get and output the result (number of likes) can be greatly reduced. However, how are we going to implement this? That’s what we are going to find out in the sections below. Before we start, your should have Node.js installed and running on a v8 environment-supported web hosting account. Check out the topics, "Getting started with Node.js" and "Installing Node.js" in our previous article, Beginner’s Guide to Node.js if you haven’t. 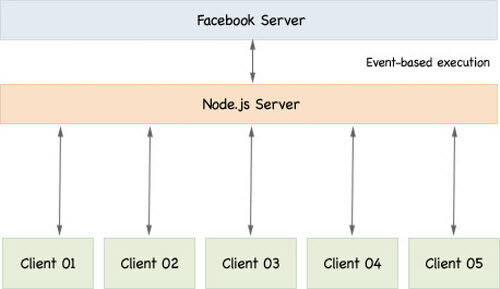 In the server we access graph.facebook.com at an interval of 2 seconds and update the number of likes. Let’s call this as "ACTION1". We will prepare a page so that it will update itself via AJAX every 2 seconds. Consider many users accessing the same page. For every user’s AJAX request an event listener is attached in the server for the completion of "ACTION1". So whenever the "ACTION1" is completed the event listeners will be triggered. Let’s take a look at the server-side’s code. 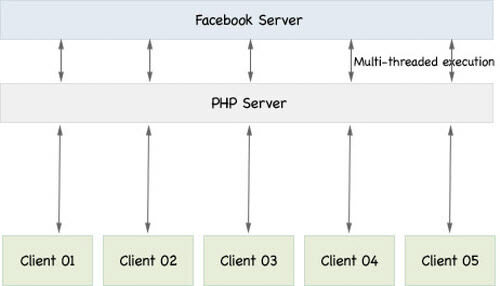 We create a HTTP client to access Facebook Graph API’s facebook_client. We also need the EventEmitter() function which will trigger when the "ACTION1" has completed. This will be clear in the code described below. Response – This listener is triggered when the request starts receiving data. Here we set body of the response to an empty string. Data – As Node.js is asynchronous the data is received as chunks. This data is added into the body variable to build up the body. You can see that a listener is attached for the event_emitter object. We need to trigger it at the end of the "ACTION1". We trigger the listener explicitly with the method facebook_emitter.emit. The above represents the response of the Facebook Graph API call. In order to get the number of likes: take the likes object of the data object, convert it to string and pass it to emit function. After this action we end the request. Creating the server is similar to the previous tutorial – with a small change. For every URL (except /getdata) we load the corresponding static file using the load_file function we defined earlier. The http://localhost:8080/getdata is the URL for the AJAX request. In each AJAX request we attach an event listener to facebook_emitter. It is similar to the addListener but the listener is killed after the listener is emitted to avoid a memory leak. If you need to check it out just replace the once with addListener. We also call the get_data function once in 1 second by the function setInterval. Next, we create the HTML page where the output displays. The jQuery AJAX part is pretty self-explanatory. Do check out the call of the load_content function. It looks like it is running an infinite loop, and yes it is. That’s how the number of likes gets updated itself. Each AJAX call will be delayed by the average time of 1 second as the delay in triggering of each such call will be 1 second from the server. The AJAX request will be in an incomplete form for that 1 second. So there you go – a method of delaying an AJAX response from the server to get the number of Facebook likes. Drop question in our comment section if you have any doubt or thought, thanks! Editor’s note: This post is written by Geo Paul for Hongkiat.com. Geo is an independent Web/iPhone developer who enjoys working with PHP, Codeigniter, WordPress, jQuery and Ajax. He has 4 years of experience in PHP and 2 years experience iniPhone application Development.